Unprecedented advances in science and technology are the hallmark of our age. This process was set in motion about two hundred fifty years ago; in the last hundred years it has reached staggering proportions, and has had a major impact on all mankind. Enormous progress has been made in theoretical and applied science, particularly in physics. Huge strides have been made in every area of technology, especially communications, transportation, and manufacture of new materials such as plastics. Atomic energy, space flight, the headlong development of computer technology, the Internet, and all sorts of sophisticated consumer devices have had a powerful impact on our human mentality, imbu­ing us with an exaggerated sense of our own power. Despite all its positive aspects, the technical revolu­tion has led to ideological and spiritual decay, which mani­fests itself in many spheres, including the mass rejection of religion. Many try to rationalize their departure from Juda­ism by claiming, "The world has changed," and "we are civi­lized, educated, enlightened people." Even those responsible for the traditional Jewish education of the younger genera­tion are tom by conflicting opinions on this issue. Some try to "tailor" the religious outlook to fit the modem era, thereby distorting the fundamental principles of religion; others spurn scientific and technological progress, adhering to the old ways, trying to ignore all modem developments, thereby consigning Jews, particularly the young, to a state of denial, ignorance, and total powerlessness in the face of contemporary reality. The Rebbe's views on this issue are crystal-clear, and he does not miss an opportunity to express them during meetings with scientists and students, in letters, personal conversations, and farbrengens. First of all, according to the Rebbe, Torah-observant Jews have nothing to fear from scientific and technological progress. After all, it is written in the Zohar that in the sixth century of the sixth millennium (i.e., during the period that began some two hundred fifty years ago), "the heavenly gates of supernal wisdom will be opened, as well as the springs of earthly wisdom.” This means that the unprece­dented advance in Torah learning - the revelation of hidden mysteries of "supernal wisdom" by Chassidic sages - will be accompanied by a parallel growth in "earthly wisdom," or science. The Rebbe teaches us that science is in itself a neutral phenomenon - like everything created by G*d. Whether it is "good" or "evil" depends on the use made of scientific discoveries. The same applies to the modem ma­chinery and devices introduced as a result of scientific breakthroughs. The entire world was created "for Torah and for Israel.” "Everything that the Almighty created in His world, He created for His glory.” In other words, science and technology, like everything created by G*d, are but the means to a sacred end, and it is obvious that everything de­pends on how they are used by Jews. Naturally, the Al­mighty expects us to exercise our free will to choose what is virtuous and good. Finally, there is the more philosophical aspect: study of electric and magnetic fields has revealed a close inter­connection between these seemingly unrelated phenomena. In fact, they are one. By discovering the unity of creation, humanity achieves a deeper knowledge of the oneness of the Creator. The Rebbe once told a scientist that there is no need to expound on the seeming contradictions between Torah and science to a Jew who was blessed by the Almighty with the priceless gift of "simple faith," someone who has no doubts or dilemmas in this regard. However, a Jew who has lost his way in the modem world, who has accepted the popular view that alleges that science contradicts and totally invalidates Torah (thereby justifying his own departure from Torah and its commandments) is in dire need of help. In his case, the issue in hand must be thoroughly explained, using the entire gamut of available knowledge, both of Torah and Science. As for the so-called "contradictions" between Torah and science, the Rebbe's position is once again clear and straightforward. The crux of the Rebbe's position may be summed up as follows: the Zohar says that Torah preceded the world, and that the Almighty "looked into the Torah and created the world.” This means that G*d created the world with Torah as His "blueprint." This implies that "creation," i.e., the world and nature, cannot deviate from the divine "blueprint." This position is fundamentally opposed to at­tempts to "tailor" the statements contained in Torah to fit the latest assertion made by scientists or reporters, "inter­preting" a certain scientific field. A vivid example of such "interpretation" is the attempt to construe the six days of Creation not as six literal, twenty-four hour days, but rather as six epochs, each one lasting for many millions of years, in accordance with theories from one hundred fifty years ago concerning the age of the universe, evolution, and so on. To counter these "scientists," as well as those who main­tain that "the Torah is not a scientific work, and thus should not be expected to provide explanations for natural phenom­ena,” the Rebbe stresses that, being the "blueprint for the universe," Torah has a direct bearing on each of its elements - every object and every phenomenon. Since the Almighty created - and permanently creates - the world and all its workings solely through Torah, all objects and phenomena owe their existence to Torah. Scientific discoveries replace, and at times invalidate one another. The constant changes and leaps that character­ize the development of scientific theories are a distinguish­ing feature of science. Obviously, it is unthinkable that, in order to avoid "contradictions," each new scientific "leap" should be accompanied by corresponding "leaps" in Torah interpretation! Torah is eternal and immutable. When a new theory seems to contradict the Torah, we should analyze the theory from the Torah standpoint, as well as determining the extent to which the theory conforms to science's own crite­ria. Then we will certainly be able to both resolve the prob­lem and find an explanation for the apparent "inconsis­tency." Moreover, as the Rebbe points out, one should never set a deadline for finding a solution, for such a deadline could force us to accept a solution at any cost within the ap­pointed time, and from there it is but a short step to falsify­ing facts. It is quite natural that we humans, finite beings with limited abilities, are not always able to find immediate answers to all our questions about the nature of the world created by the Almighty - who is infinite and limitless. As for the true value and validity of scientific theo­ries, the Rebbe states that theories fall into several catego­ries. Some theories are concerned with natural phenomena and objects which the researcher can contact directly, or processes in which they can intervene in order to discover their concealed characteristics. For example, theories about the structure of matter and electromagnetic forces may be reliable, yet they do not reveal the absolute truth. The very nature of science is such that any scientific theory under­goes constant modification, as ongoing research discovers new characteristics and phenomena that not only deviate from the existing theory, but at times refute it altogether. There is, however, another group of theories that deal with distant celestial bodies, such as stars and galaxies. In this case, even before developing a theory, the scientist must thoroughly investigate the nature of the signals received during observation of these distant objects. The findings of such experiments are open to various interpretations. The same may be said about the study of the tiniest elements that make up matter - the elementary particles - whose behavior cannot be observed directly. In that case, the observer can at least intervene in the process, something that cannot be said about stellar research. This type of theory is naturally less reliable and has less cognitive value. Finally, some views aspire to the stature of theory, even though they should be rightfully considered conjec­tures or hypotheses at best. Attempts at theoretical recon­struction of natural processes that occurred in the very dis­tant past belong to this category. These include cosmogonic and geological "theories," as well the evolutionary "theory" of the development of the animal kingdom. Proponents of these "theories" rely on our present knowledge of physical, chemical, and other natural phenomena to explain how the world came to be what it is today. The technique most commonly used in this type of research is extrapolation, i.e. intuitive extension of the known characteristics of a certain phenomenon beyond the temporal framework of direct ob­servation and measurement. Extrapolation has never been considered a precise scientific method, especially regarding the past, which cannot be revisited in order to subject the results of extrapolation to direct, objective testing. The Rebbe emphasizes that the adherents of these "theories" do not find it necessary to inform their students that they are dealing with mere conjecture, which cannot be proven, verified, or even convincingly invalidated. Instead, they present these "theories" as established fact. Many people readily accepted the theory of evolution for purely psychological reasons. Someone who forgot - or never knew - that the human mind cannot comprehend G*d presumes to form opinions about G*d's ways by attributing to Him human qualities and limitations. Such thinking runs roughly as follows: "If I were creating the world I would have two possible ways - I could either create everything, from inert matter to living beings, down to the last detail, or I could create matter, time, and space, fix the laws of nature, and let the universe evolve on its own. I would definitely choose the latter. I would simply have no time in which to create all the trillions of creatures separately." The person is not even aware that such thinking projects human limita­tions and human logic onto the Creator! The Rebbe repeatedly stresses that when a commonly accepted concept regarding a specific natural phenomenon does not conform to the halachic description of that phe­nomenon, we should in no way view the halachah as alle­gorical. Thus, the Rebbe states that, for example, when the Tanach, the Talmud, or the Rambam asserts that the earth is the center of the universe, with the sun revolving around it, this should be understood literally. According to the scien­tific theories of a hundred years ago (Newton's classical mechanics), such statements would have been laughable. Now, according to Einstein's universally accepted theory of relativity, this view is absolutely plausible. Indeed, accord­ing to the general theory of relativity, it is impossible to de­termine conclusively which body revolves around which, or which one is actually moving and which is static. From the standpoint of science, the question is meaningless. Even some physicists, who are supposed to be experts, err on this issue. Views inculcated in childhood have such a deep effect on their perception that they invariably hold sway over their professional knowledge. They find it hard to accept the idea that in this day and age the concept of the earth standing still is perfectly compatible with science. Incidentally, in recent years, a long time after the Rebbe first stated his opinion on the subject, astrophysicists have begun to base their research on the "anthropocentric principle," according to which the earth is situated at the center, while the rest of the universe with its billions of stars creates the precise conditions that make human existence possible. Books on this subject have begun to emerge even in such strongholds of science (and atheism!) as Cambridge University. The Rebbe attaches enormous importance to the fact that as early as the turn of the twentieth century, modem science rejected the Newtonian principle of absolute deter­minism, which had been commonly accepted in the past. According to that view, there is a direct connection between cause and effect, and by knowing the causes, one can accu­rately predict any given effect in advance. This approach eventually reached the point that the famous French scientist Pierre Simon Laplace announced that from a precise and comprehensive description of each atom in the universe, as well as its state at a given moment, he could infer the exact behavior of any object in the universe at each moment in the future. He believed that this power of foresight also extends to the conduct of any human being, in keeping with the Newtonian view that the laws of science may be used to ex­plain and predict the behavior not only of inert matter, but also of plants, animals, and even humans. Naturally, Laplace's approach completely negated the concept of free­dom of choice depicted in Torah. Furthermore, this view set the ground for the denial of Divine Providence and G*d's involvement in all that happens in the world, as well as dis­missing any possible effect of prayer and human actions on physical events. As early as several decades ago, the Rebbe explained that quantum theory, by introducing the notion of inde­terminism into every area of science, had completely dis­credited Laplace's idea. Quantum theory, which places ma­jor focus on the phenomenon of light, asserts that light is simultaneously a flow of minute particles - photons - and short electromagnetic waves. In other words, light has a dual nature. According to quantum theory, which is com­monly accepted today, duality characterizes all the particles that make up the universe - electrons, protons, neutrons, etc. This theory further states that it is impossible to simultane­ously measure the location and speed of a particle with any precision, and to predict the behavior of any given particle. The most we can do is establish the probability of its behav­ing in a certain way. Relatively recently, physicists began to realize that the behavior of a particle, and ultimately the very fact of its existence, depend on whether the observer possesses freedom of choice, and is thus not subject to the laws of nature. Significantly, the Rebbe constantly stresses that according to Torah, the testimony of eyewitnesses veri­fied and accepted by a rabbinical court not only influences halachic rulings, but also determines the behavior and prop­erties of physical objects. In other words, modem science is finally embracing views contained in Torah and recorded by Talmudic sages nearly two millennia ago. The Rebbe also illustrates that one can reach scien­tific conclusions based on the words of Torah. This does not refer to hidden mysteries accessible only to the righteous blessed with divine, spiritual visionary gifts. In certain cases this path is available even to illiterate Jews. The Torah, as the Rebbe teaches, embraces the entire world, and certainly contains answers to all the questions that have to do with this world. The following is a typical example of how the Rebbe resolves a complex scientific issue by relying on a straight­forward interpretation of Torah. One of the most frequently asked questions is whether intelligent beings exist elsewhere in the universe. The Rebbe's reply is that according to To­rah, such beings do not exist. What distinguishes human be­ings from other creatures is that we have freedom of choice. At first glance, the idea of "freedom of choice" or "free will" seems to be contrary to such concepts as Permanent Creation (G*d's ongoing recreation of the material world and all that it contains), Divine Providence, (G*d's supervi­sion of the creation), and so on. However, G*d does not in­terfere with our free will. Freedom of choice is part of G*d's master plan outlined in the Torah. Torah is above all a book of 613 commandments. These commandments can be relevant only to beings that are free to choose between performing them or, G*d forbid, rejecting them. Therefore bestowing the Torah is contingent upon granting free will. Thus if we assume that other intelligent beings exist in the universe, they too must have the Torah. It could not be a dif­ferent Torah, for our Torah is called Torat Emet - the "To­rah of Truth,,,40 and there can only be one truth. On the other hand, they cannot possibly have our Torah, for Torah was given to the Jewish people in the Sinai desert, and eve­rything that happened before and after this event is de­scribed in great detail in the Torah itself, with specific names, geographic locations, and so on. Our Torah would be totally unintelligible to alien beings. Therefore it follows that there cannot be any other intelligent beings similar to humans in the universe. On the other hand, the Torah does not rule out the possibility that other living beings exist in outer space. The full scope of this topic cannot be covered in a few pages. Here we have only cited a few examples to illus­trate how the Rebbe appropriates scientists, and science it­self, to the service of G*d and to the cause of precipitating the time of Mashiach. Over the last century, and particularly in recent dec­ades, scientific views in all the natural sciences have begun to converge with Torah-based philosophy. This phenome­non appears to be another harbinger of the imminent arrival and revelation of Mashiach! Indeed, only the Rebbe could have predicted that the rational sciences, which are based on "cold reason" and which had just recently denied the Torah and the Almighty, would recognize Him, and accept the ex­istence of the soul and a number of other basic concepts of Torah! It seems that over time scientific theories have changed and are gradually coming more into accord with Torah. An increasing number of respectable academic bod­ies, including universities, are publishing scientific works dealing with issues that were, until recently, the exclusive domain of religious literature. The interaction between the human mind and the soul, freedom of choice, even resurrec­tion of the dead are examples. Popular magazines feature articles bearing titles such as "The Sciences Discover G*d!" Advanced studies of the physiology of the human brain show have disproved the so-called "reductionist" ap­proach, which denies the existence of a soul and reduces man to a sophisticated machine that acts according to laws of nature. Thus, for instance, studies by Wilder Penfield in Montreal, Canada show that the brain functions as a com­puter, but the human mind, the self, is beyond the brain. It is amazing how Penfield, and other researchers, are coming to recognize the existence of the soul. All together, we see that in our times not only are in­dividual scientists coming to believe in G*d, but entire sci­ences are becoming baalei teshuva - "returnees" to faith. The Rebbe sees in this return and recognition by science and scientists of the divine foundation of nature one more sign that we live in the age of Mashiach. Indeed, the Mashiach said that he would come when the Baal Shem Tov's teach­ings "spread to the outside." For centuries, science was the epitome of "outside" the Torah in general and Chassidism in particular. Now science recognizes G*d - the Creator! The Rebbe advises those Chassidim who work in sci­ence to use every opportunity to spread recognition of the Almighty Creator of the universe. He emphasizes the vital need to acknowledge His Torah and commandments. On one occasion, the Rebbe received an expert in solar energy. In the course of the conversation, the scientist mentioned that he was about to attend a conference of Jewish religious scientists. The Rebbe told him, "Tell them that as an expert on solar energy, you propose that each and every Jew strive to emulate the sun. Why is the sun a symbol of good? After all, countless stars are larger and contain more energy than the sun, yet some of those stars are called 'black holes' be­cause their gravity is so strong that they devour everything around them, including light. Thus, when we look at such a star, we see nothing, and so it is called a 'black hole.' The sun, on the other hand, radiates light and warmth, sharing its riches with the whole world. This is how a Jew, who is com­manded to love each child of Israel, should live. Who would ever mention the sun if it only warmed itself, like a black hole?" 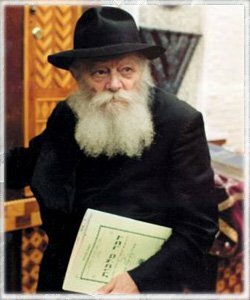 On another occasion, the Rebbe said, "A Jewish sci­entist should try to live and conduct himself so that others would describe him as a pious, Torah-observant Jew first and only then as a scientist, and never the other way around, as a great scientist who, incidentally, keeps Torah and the commandments."